Navigate the Thames Estuary, sail across the Channel (twice! 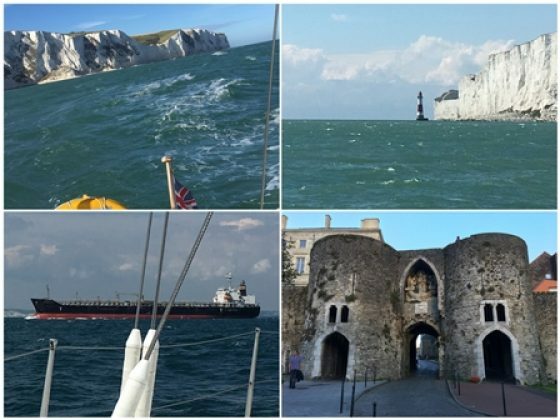 ), sail close to iconic landmarks - White Cliffs, Beachy Head, Seven Sisters, Selsey Bill, Solent Forts. 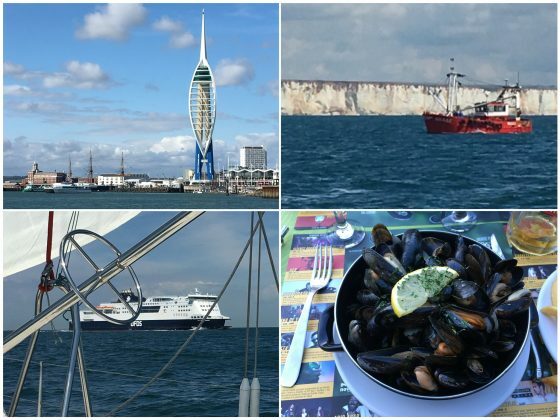 Cruise With Us To The Solent…….. Gift an amazing sailing experience to your favourite seafarer wannabe! Buy a personalised voucher for a taster sail, yachting course, or any of our other fun-filled seaborne adventures on the gorgeous Suffolk coastline or beyond. Our sailing vouchers can be used to pay for one of our Midweek Special sailing days, or to offset the cost of any of our courses, charters or cruises. You can buy up to four credits, each worth £80, on each voucher. What better way to watch an epic sporting event than to have a grandstand seat? Better still, how about a seat that moves around with the action, with a coffee and nibbles never more than an arms reach away? Where, still firmly attached to your seat, you can graze away at your lunch without queuing for hours to fetch it? No such thing? Think again! We have opportunities aboard our beautiful yacht Wings for companies, private groups and day sailors to do exactly that. Contact us to discuss your preference and enjoy a fabulous day with your friends, family, staff or clients, or simply treat yourself in the company of like minded sailing fans. Dates currently available from 6-11th August, leaving from/returning to East Cowes Marina on the Isle of Wight. Accommodation on board can be arranged at no extra cost, subject to availability. If you’re looking for something ‘different’ to do over the August Bank Holiday weekend, well, what could be more ‘different’ than joining us on a cross-Channel trip to Dunkerque! Sixty-something miles across the southern bit of the North Sea, negotiating the busy shipping lanes at the top ends of the Thames Estuary and English Channel, into historic Dunkirk. After a day at leisure, perhaps visiting some of the memorials for which Dunkerque is so well known, certainly enjoying some French cuisine, we will set off again for our return passage to Shotley. An early morning start should see us back at base by late afternoon. The trip will start at Shotley in the early morning of Saturday 25th August, so it would be best to plan to join us on the prior evening. We will be the lead boat, ‘cruising in company’ with other Shotley Marina boats, so we will almost certainly arrange a social function either on the dockside or at the local marina restaurant. Dates: 25th to 27th August 2018. Comfortable accommodation is available on board Wings, but if you prefer to stay ashore at Shotley on the Friday, good quality accommodation is available at the Shipwreck Loft at the marina. You can see more at their website http://www.shipwreckpub.co.uk/stay-shipwreck-loft/ . Also there are several hotels in Dunkerque to choose from – we suggest you take a look via your favourite hotel booking site, remembering that we will be wanting to slip lines at 0600! Another great opportuity for some serious cruising as we head back to Shotley from the Solent via the South Coast and France. A fabulous sailing adventure for those who want to enjoy more serious passages, or who are looking to build crewing or skippering experience or miles to put towards some of the higher level RYA courses. For many crossing the Thames Estuary or English Channel under sail would be genuine ‘bucket list’ contenders. Join us on this trip to tick both off in one hit. Sail past iconic British coastline landmarks that most people will have heard of, but few will have witnessed close-up – Beachy Head, the Seven Sisters, Selsey Bill, and the 19th century forts built to protect the Solent. It will be a few days of adventure, and maybe a glass or two of French red, plus some time to explore Brighton – maybe shopping in the Lanes or a stroll along the pier. The journey will start from the Solent (probably Portsmouth) on the weekend of 15/16 June 2019. * stopovers in Brighton, Eastbourne, Boulogne and/or Dunkerque and Ramsgate. * ideal for cruisers/milebuilders/passage makers/those wishing to achieve their RYA Competent Crew or Coastal Theory tickets. Each leg is 40-60 miles (with the exception of the 20 mile hop from Brighton to Eastbourne. If you haven’t yet visited Boulogne, the old town is a beautiful place to wander along the cobbled streets and maybe enjoy a plate of moules frites and a glass of something, whilst Dunkerque, of course, is famed for its wartime memorials. At this stage the trip is available to either individuals who wish to share, or for exclusive charter. A fabulous sailing adventure for those who want to enjoy more serious passages, or who are looking to build crewing or skippering experience or miles to put towards some of the higher level RYA courses. For many crossing the Thames Estuary or English Channel under sail would be genuine ‘bucket list’ contenders. Join us on this trip to tick both off in one hit. Sail past iconic British coastline landmarks that most people will have heard of, but few will have witnessed close-up – the White Cliffs of Dover, Beachy Head, the Seven Sisters, Selsey Bill, and the 19th century forts built to protect the Solent. It will be a few days of adventure, and maybe a glass or two of French red, and some time to explore Brighton – maybe shopping in the Lanes or a stroll along the pier. The journey will start from Shotley Marina over the weekend of 8/9 June 2019. Each leg is 40-60 miles (with the exception of the 20 mile hop from Eastbourne to Brighton. If you haven’t yet visited Boulogne, the old town is a beautiful place to wander along the cobbled streets and maybe enjoy a plate of moules frites and a glass of something. Ramsgate is one of our favourite stops, normally highlighted by a visit to the Royal Temple Yacht Club and fabulous fish ‘n’ chips at Peter’s Fish Factory. We could turn right, head north up past Brightlingsea, duck into Pyefleet Creek and pick up a mooring buoy (or drop the hook). Then watch as your pre-ordered box of crab, lobster, king prawn, mussels and more – not to mention locally sourced oysters – is delivered to the boat. Yes, really. It’s a bit like a drive thru without the driving or the queuing! And then, replete with fruits de mer, you could sit and watch the sunset over Mersea Island. Or go straight ahead. Past the Colne and up the Blackwater to West Mersea. Thumb a lift from the yacht club ferry to the jetty, and stroll ashore to make a late lunch table booking at the famous Company Shed. Perhaps (hopefully!) there’s time for a quick drink in the West Mersea Yacht Club beforehand. Followed by a fabulous seafood platter in one of the simplest but most fabulous restaurants you will come across. Hey, if you’re a real seafood junkie you could even do both! Prices: Please contact us for prices and availability. This is a two or three-day trip. The Annual Pin Mill Barge Match, one of a series of regional barge matches, is held in late June/early July. Starting on the River Orwell, and following a course dictated by the day’s weather and tide conditions, the match is a true spectacle of years gone by. Once coastal cargo carriers, these beauties have been lovingly restored and maintained, and several are available for day trips, charters and social occasions. This is very much a day sail with a difference, as the itinerary will be geared to a very satisfying combination of match watching – with the endless photo opportunities this will entail – plus time to enjoy your own bit of sailing up and down the Orwell and Stour rivers. You will see a veritable forest of brown sails, gaffe rigs, and more ‘ropes’ than you can shake a stick at. We will need to leave Shotley by 1000 latest, after coffee and a safety briefing. It’s a 2 ½ hour sail down to Clacton, and once there we drop anchor as close to the ‘fairway’ as possible. The fairway is a cordoned off area of the sea just off Clacton Pier, and it is above this area that the serious flying is done. Which means the planes seem to almost clip the top of our mast as they zoom past! When we’ve nibbled our way through the 3-4 hour show, it’s time to weigh anchor and head back home after a truly memorable day. Our skipper will work with you before your trip to create a passage plan to suit your requirements and the experience of your party. This will obviously depend on tide predictions and the number of days you choose to book for. There are many fantastic destinations to the North or South to choose from, and a variety of ‘challenges’ ranging from passages which are – relatively speaking – ‘just around the corner’ to Channel crossings. Possible destinations include Aldeburgh, Southwold, the Blackwater, Burnham and, further afield, the Thames Estuary, London and the Continent. Your skipper gives you the options for the day (weather and tide dependent) and you decide the agenda. A river sail, a short coastal cruise, a bit of both – whatever ‘floats your boat’. Your day starts with a coffee and the essential safety brief on board, and then you head out on your sailing adventure. Maybe you’ll choose to explore the rivers in the morning, or head round to Hamford Water if the tides are right. After anchoring for lunch on board (full day trips only) – typically a sumptuous spread of cold meats and cheeses from Suffolk Food Hall – you might decide on an afternoon at sea. Maybe checking out Rough’s Tower (the ‘Principality of Sealand’), or a round trip past Felixstowe to the Deben entrance, before returning through the lock to Shotley Marina. Why not extend to a Sleepover Sail? Stay on board the night before, maybe have dinner aboard, and enjoy a bacon roll breakfast before sailing the next day. * These are our base prices which cover two adults. There is a supplementary charge of £15 per additional adult (half-day trips) and £20 per additional adult (day trips). Up to four children (aged 16 or under) go free when accompanied by two adults. A lot of people do most of their sailing at weekends, and that’s when we are often at our busiest. But if you’re lucky enough to have time for some sailing on weekdays then our Midweek Specials might be just the thing for you. You will get the same fabulous day sailing experience but at a great price of £80 per day. The only difference to any other day sail is that we ask you to bring your own lunch, and the only other proviso is that we need a minimum of 3 people to run the day. Simply register for our newsletter (sign-up is available at the foot of all our website pages) and we will let you know the Midweek Special dates for the following month along with all our other news and offers. If you would like to buy a Midweek Special as a gift for someone else, take a look at our Sailing Gift Voucher option – when you buy we will send you a PDF by email, and your lucky friend can contact us directly to arrange their date. We group together up to 6 people who want to share the cost of sailing with others. Your day will start at Shotley Marina where your skipper will give you a safety briefing over a cup of coffee on board. You’ll help prepare the boat for departure, exit the lock gates, hoist the sails and head out for an adventure on the local rivers and coastlines. You will get the chance to participate fully in the running of the ship – hoisting, helming, trimming – hey, you can even put the kettle on if you like! After a morning sail we will drop anchor for lunch on board, maybe at Hamford Water (Secret Water), Wrabness (beach huts on stilts), or somewhere on the very beautiful River Orwell. After lunch, more sailing, more fun, and more tea (and perhaps a cheeky biscuit) before heading for home. Suffolk Coast Sailing runs RYA Day Skipper and Coastal/Yachtmaster Theory classroom-based courses at venues in the East Anglia region. We also offer private, one-to-one courses, and courses for groups (businesses, clubs and associations) at your chosen venue. Face to face courses are best if you prefer to learn in an interactive environment, as you benefit from wider discussion prompted by questions from other participants. You can scroll down for more information about each course, or contact us for more information, course dates and availability. A comprehensive introduction to cruising for inexperienced skippers. This course equips you with enough knowledge to navigate around familiar waters by day. A basic knowledge of lights is also included to introduce you to night cruising. The course is taught over 40 hours with two exam papers. Advanced training for more experienced skippers building on the Day Skipper course. This course equips you to navigate safely on coastal and offshore passages. This course will take your theory knowledge to the standard required for the Yachtmaster™ Coastal and Yachtmaster™ Offshore practical exams, concentrating on advanced navigation and meteorology skills. The course is taught over 40 hours with three exam papers. All of our RYA courses can be run in the comfort of your own boat, or we can tailor a programme to focus on what you need to learn, practice or perfect the most. The agenda is very much up to you, and we will discuss your needs thoroughly before recommending a program for you. A reasonable level of safety gear will be needed on your boat, which we will discuss with you before booking. Cost: Please contact us for prices and availability. We may need to add travelling expenses if your boat is located away from the Suffolk coastal area. Advanced skippering techniques for yachtsmen and women with considerable knowledge of sailing and navigation, wanting to undertake coastal passages by day and night. Like the Day Skipper course, this course consists of skippered passages in a variety of situations. Each trainee will skipper more challenging passages and learn more about passage planning, pilotage by day and night, boat handling, safety and emergency situations. We will expect you to complete the Coastal Skipper/Yachtmaster™ Offshore theory course beforehand as there is insufficient time to teach you theory during the week. Coastal Skippers should be able to undertake more difficult passages by day and night and handle the yacht in more demanding conditions. A course for aspiring skippers with some yachting experience and basic navigation and sailing skills. Learn to skipper a short passage with the instructor on hand to give advice and encouragement and ensure your safety. Experience being in charge, taking credit when it all goes well and being responsible when it doesn’t. If it’s help with navigation that you need, you should take our Day Skipper shorebased course. Assumed knowledge: Theory to the level of Day Skipper. It is recommended you attend the Day Skipper shorebased course beforehand. This course is for beginners and those who would like to become active crew members rather than just passengers. Course content: The yacht, ropework, underway, rules of the road, man overboard recovery, clothing and equipment, emergency equipment and precautions, meteorology. Ability after the course: Basic knowledge of yachting.